That looks so cool! I wish I had some advice to give, but mine always die at transplant too. Once they come up you can put fluorescent lights right above them to keep them from reaching for light and getting all spindly. I think I would try on your glassed in porch. I haven’t tried one of those. We did try growing some under a grow light and then we transplanted them outside. Some did not make it while others did. I hope that you can get it to work. I like Vicki’s idea of putting it on the glassed in porch. Hi Donna… I have no idea how to use one but I remember last year one of the bloggers had one but it was on her porch… ????? Can’t help you with that one. I’ve never seen one. I can relate about the seeds. I don’t seem to have much luck either but Mia and I have some planted. It is frustrating to work so hard just to have them die. I hope Grace has lots of success. Keep us posted. If I sell it through the website then I ship. If someone local buys it, then I just meet them somewhere. I have purchased through website and have saved lots of $$$. Hope this helps. It looks like you had a great Easter! 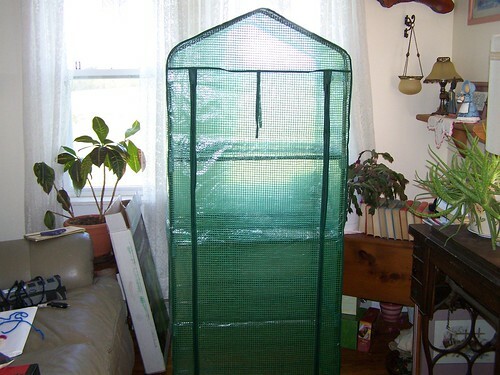 Good luck with your greenhouse. I hope we both have a great growing season. I have a friend that has one of these. I will have to ask her on Sunday if she has any advice. She does really well at getting her seeds started in it. It is her small families home business. I’ll let you know.